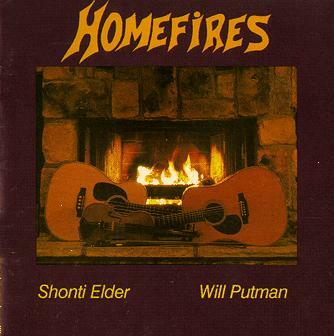 Wild Mountain Music was formed as a partnership between Shonti Elder (fiddler) and Will Putman (guitarist) in 1987 to record and distribute original Alaskan music as singer songwriters. The music combines a variety of acoustic styles based on bluegrass, celtic, and traditional American fiddle music. Wild Mountain Music also produces concerts and has created a catalog of Alaskan folk artist's and their music. To purchase this album or to contact us regarding Wild Mountain Music, our recordings, or information on the Catalogue of Alaskan Artist's see below. Homefires (1991) is another great collection. 16 tunes, all original except for Fishing in Montana by Jensen & Thompson, which we liked so much we added it to our album. Available on CD and cassette. The linked songs are wav samples, just click and listen. Featured songs: The Alaska Highway, Airstrip, Friction (a love song), TV Trained Sleepless Baby Blues, Fishing in Montana, Stop the Clock, The Game, Plastic Flowers, Missing a Man, Grandfather, Rolling fog, No car in the parking lot, Family reunion, Allegheny Home, Kluonie Stomp. Buy it online above or send $15 for CD's, $10 for cassettes or albums. Free Shipping! Make checks payable to Trill Music.